Ian Hatcher is a writer, sound artist, and programmer whose work explores cognition in the context of digital systems. 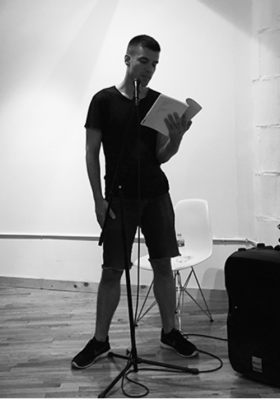 He is the author of a poetry collection, Prosthesis (Poor Claudia 2016); a forthcoming vinyl/mp3 record, Drone Pilot (cOsmOsmOse 2017); two chapbooks, Private (Inpatient 2016) and The All-New (Anomalous 2015); and numerous screen poems, including the iOS app Abra with Amaranth Borsuk and Kate Durbin. His code-inflected vocal performances have been widely presented in North America and Europe.